One of my favourite things about the month of March is welcoming the new group of Engineering Science and Biomedical Engineering undergraduate students into the Department. Their energy and enthusiasm is always refreshing. As usual at the end of the second week of semester everyone piled onto three buses for a field trip. The trip started with visits to companies who employ our graduates. We often catch up with former students (now launching successful careers) on those visits. We all ended up Rotorua (after a great visit to Contact Energy's Wairakei geothermal plant in Taupo). This year I added a new component to the trip with a visit toTe Puia. The group were welcomed onto the Te Puia marae, enjoyed a cultural performance and a hangi dinner, and then witnessed the awesome sight of the Pohutu geyser discharging as the sun set. Once we returned to the backpacker accommodation that was home for the night I talked to the students about why the Te Puia visit was part of the trip. As the students start their journeys through our degrees I want them to remember that NZ operates under a principle of partnership - through the Treaty of Waitangi. We talked about the fact the Contact Energy and the Tauhara North No.2 Trust work as partners on the geothermal developments the students had seen that morning. Kia mau Ki te whenua (hold fast to the land). Whakamahia te whenua (make use of the land). Hei painga mo nga uri whakatipuranga (for the future generations). We talked about the key role of engineers in supporting sustainability - an example of which is the computer modelling work done in the Department of Engineering Science that considers the geothermal resource underlying the city of Rotorua. 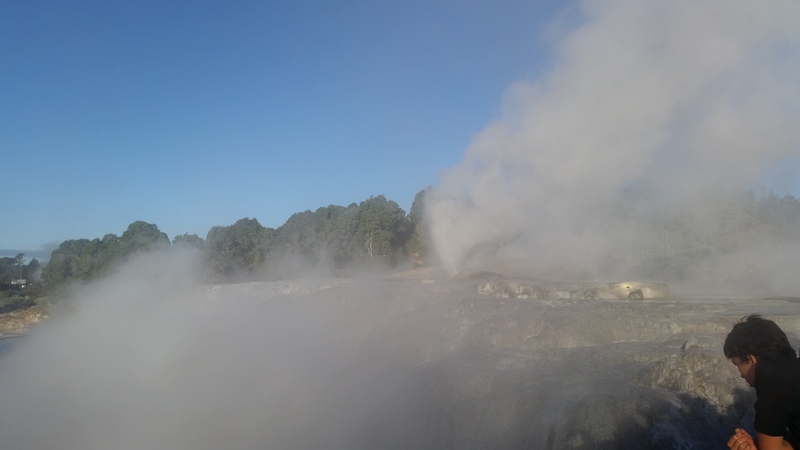 That model helps understand the impact of the closure of private bores in Rotorua which allowed the important Pohutu geyser begin to flow again. For the next few years our new students will face the challenge of building their knowledge of a set of mathematical and computational tools that can help understand natural systems (as well as manufactured ones). However one challenge I would like to see engineers and geoscientists embrace is broadening their insights to acknowledge and value Matauranga Maori. Dan Hikuroa recently discussed this in a geological context on Maori TV - pointing out that events attributed historically by Maori to taniwha may well be attributable to earthquakes. There's definitely insight to be gained if everyone - regardless of their cultural heritage - integrates all forms of knowledge of the processes and forces that shape the earth. Those processes give us geothermal energy reservoirs which sustain us, and earthquakes which we must be resilient to. Posted in Uncategorized and tagged field trip, geothermal, geyser, Te Puia on March 29, 2017 by rarc002.